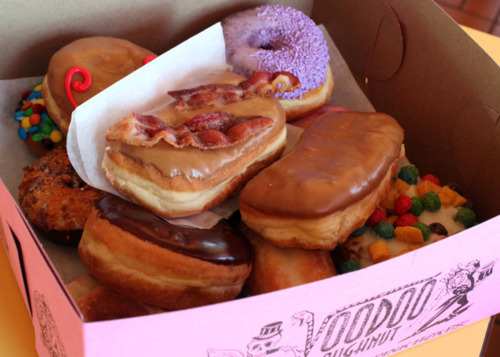 When I heard about Voodoo Donuts‘ soft raised donuts covered in sweet maple frosting and crisp bacon, I thought I’d died and gone to heaven. The last couple of trips to Portland, Oregon we’ve stopped by Voodoo’s pink building to wait in line for our chance of snagging one before they were sold out for the day. Desserts with bacon are nothing new to the culinary world. Bacon-covered chocolate, bacon brownies, and bacon delights even going mainstream with Jack in the Box introducing the bacon milkshake. Say it ain’t so. 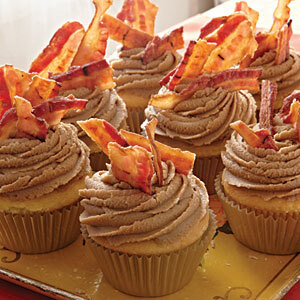 A few weeks ago, craving a Voodoo maple bacon bar, I found this recipe for maple bacon cupcakes and made them for a group of friends. Besides being easy to make, they got the thumbs up as they went down gullets. It’s not exactly a Voodoo donut but this recipe is a keeper! Preheat oven to 350 degrees. Beat butter and sugar at medium speed with an electric mixer until creamy. Add eggs, 1 at a time, beating until blended after each addition. Combine flour, baking powder, and salt; add to butter mixture alternately with milk, beginning and ending with flour mixture. Beat at low speed until blended after each addition. Stir in vanilla. Place paper baking cups in 2 (12-cup) muffin pans, and coat with cooking spray; spoon batter into cups, filling two-thirds full. Bake for 12-15 minutes or until a wooden pick inserted in center comes out clean. Cool in pans on wire racks 10 minutes; remove from pans to wire racks, and cool completely. To prepare frosting, melt butter in a heavy saucepan over medium heat. Add brown sugar; bring to a boil, stirring constantly. Stir in evaporated milk, baking soda, and light corn syrup; bring to a boil, stirring occasionally. Remove from heat, and let cool. Transfer caramel mixture to a large bowl. Gradually add powdered sugar to caramel mixture; beat at medium speed with an electric mixer until creamy. Stir in maple flavoring. Beat at high speed 2 minutes or until creamy. Icing firms up quickly, so use immediately. Makes 3 cups. Frost each cupcake with Maple Frosting using metal tip no. 2D. Top each with bacon. Oh Lord. I don’t eat much sugar or meat, but I’m feasting my eyes on that brilliant mashup!